I've carried (and competed with) all kinds of guns over the years. Glocks, 1911s, CZs, Sigs, etc. Heck, my first carry gun when I didn't shoot much or know much was a Taurus. For 2019, I'm doing something a little different. My firearms goal for this year is to only carry and compete with revolvers. Competition has been great for learning how to handle stress, moving with and shooting a firearm while under pressure, and making shoot/no shoot decisions rapidly. It has also made me a little more careless with my shot placement, since a fast A and C zone hit are sometimes better than two slow As when it comes to competition scoring. I also have developed a tendency to "quit early" and start looking for the next target before I finish a trigger pull right now, leading to more Cs and Ds than I want, and outright misses in steel matches. Long, DA revolver triggers should help force me to finish a shot and get both sight pictures before moving on to the next target. USPSA arrays are also limited to requiring no more than 8 shots from any single position (thanks 1911 guys). I'll be shooting an 8 shot revolver in USPSA, so any miss forces a flat footed, long reload...which is death to a good run time. That stage design is really going to force me to realign my focus away from speed and towards accuracy. When I'm not competing, I teach intro/newbie classes to folks just starting out in the firearms world. As an instructor, it's rare that anyone is only interested in learning how to shoot a revolver these days, but it would be nice if I had a little more experience with revolvers than "yeah, I'll throw this J frame in my pocket occasionally and shoot maybe 200 rounds a year through it" to share on that front if someone was only interested in learning how to shoot and carry a wheel gun. So, lots of good reasons to spend a year getting to know the wheel gun a little better. S&W 627: 8 shot .357 N Frame, 4" barrel. It takes moon clips, which is what I'll be using in competition for it. For competition I'll be using a Speed Beez OWB kydex holster and 8 post moon clip carrier. For carry I've got a Galco leather OWB holster and a speed beez speedloader. I could have gone with a 5" version for a more "competition ready" gun, but I want to carry it as well at 4" guns are just easier to carry for me. S&W Model 10: 6 shot .38 K frame, 4" barrel. Not cut for moon clips. The 627 is not IDPA legal, so this will be my primary IDPA gun, using Safariland Comp 3s to reload it. This one is used and has an unknown number of rounds through it already. I'll use a comp tac kydex OWB holster for it in competition, and have a JM Kydex AIWB holster for when I carry it. Comp 3s will be used for concealed carry reload as well as in competition. S&W 637: 5 shot .38 J frame, 1.8" barrel. Also not cut for moons. I'll be carrying this when I can't manage to conceal anything else, but I also want to compete with it some, so I'll bust it out for both some IDPA Back Up Gun stuff and some steel challenge. I'll probably use Speed Beez speed loaders for it during both competition and carry. Don't have a competition holster for it yet, but do have both IWB and pocket holsters for it from Desantis for carry that both work really well. S&W 586 L Comp: 7 shot .357 L frame, 3" comp'd barrel. Cut for moons, have a Galco IWB holster for it and a speed beez speedloader on the way as well. Honestly, this one just seemed to fill the gap between traditional/modern 4" 6 and 8 shot revolvers and the typical J frame, so I wanted to add it to the mix. Ruger LCRx: 5 shot. 38, 3" barrel. I wanted at least one Ruger in the mix, and this one was the most interesting to me. I wish it was a 6 shot, but a 3" barrel and adjustable sights are both huge pluses. I plan on using this in the same Steel challenge matches I shoot the 637 in, because I'd love to compare and contrast the 3" barrel gun and the "true" snub nose S&W in both accuracy and speed. Other than that, I'm curious to see what niche I find for it. I hope at the end of the year to have a better appreciation for and understanding of the double action trigger, the difficulties of revolver reloading, a better eye for stage planning, and to be a more accurate and deliberate shooter. In addition to carrying and competing with these guns, I have some drills I'd like to try to shoot as "benchmarks". I'll be shooting them pretty raw this month (very minimal dry fire, reload or live fire practice with any of these guns), so hopefully as I dry fire, practice and compete I'll be able to see progress in my ability to shoot the wheel guns over the year. Lots of them are inspired (read: taken straight from) a PatMac class I took in December. If you ever get the chance to take a class from him, highly, highly recommend. 5 second standards. Target: IPSC Silhouette. Start at 7 yards. Fire two shots from low ready with 5 second par time. Fire 2 shots from the holster, then 2 shots from the holster strong hand only. 5 second par time for each. Only A zone hits count. Anything else=failed drill. If you pass at 7 yards, move back to 10 and repeat. Then 15, 20, 25, etc until failure. 500 point standard. Target: 2 NRA B8 targets. At 15 yards, fire 10 rounds with both hands, 10 strong hand only, 10 weak hand only. No time limit. Add up points out of 300. Next string on second target: From a holster at 15 yards, 10 rounds in 30 seconds. Then, 10 rounds in 15 seconds. Add up points out of 200, combine two targets for total points, max is 500. Modifying the 500 point standard a bit for a revolver. I'm testing reloads in other drills and this one is all about accuracy at speed. So I'm going to fire the timed strings like this: Fire until empty on a timer. Subtract time taken from 30 or 15 second limits to set a new max par time, reload, finish course of fire. That way I still have 15 seconds to complete my 10 round course of fire, without using 2-3 seconds of it for a reload. I'll be timing reloads on other drills. Wilson 5x5. Target; IPSC Silhouette. 10 yards. 4 strings. 1st string: draw, 5 to body. 2nd: draw, 5 to body strong hand only. 3rd: Draw, 5 to body, reload, 5 more to body. 4th: Draw, fire 4 to body 1 to head. Add all strings for total time. C is +1 second, D or head is +2, miss is +5. Modified Close Speed Drill: Langdon's 9 shot close speed drill modified for revolver. 3 IPSC targets shoulder to shoulder. 2 yards. Engage single shot left to right, then right to left, then head left to right again until out of ammo. Record time. Only A zone hits count. These should give me a good idea of what I'm improving on, what I need to focus harder on, and the difference between what I can do with a 4" revolver and good sights and a J frame and crap sights, for example. I've been traveling this month and 3 out of my 5 guns are currently unavailable (627 and 637 went to a smith for trigger work/apex springs, LCRx shipped without its rear sight so I'm waiting on parts from Ruger). Didn't have a ton of time, but managed to at least shoot 5 second standards with the M10 and 586 this weekend. Failed at 10 yards on strong hand only with the M10, failed at 15 yards strong hand only with the 586. As a comparison point, I can typically clear this drill out to 15 on demand with any of my CZs. I have a lot of work to do mastering the double action trigger pull, but that's part of why I'm doing this....to push myself outside of my comfort zone, develop better trigger control, and learn some things. I've always been fond of "El Presidente" as a revolver drill. With only 12 rounds and no movement beyond the initial half turn, it forces you to place the appropriate concentration on accuracy (sight picture and trigger pull) in order to get a good score on it. IIRC, some years back your EDC was a Rock Island Armory 1911, 5" barrel, .45 ACP. Do you still have it? Nice video, & awesome thread. Always good to see people pushing themselves to excel! Obviously you know what your doing, & shooting well within the 5 second standard / A Zone. If you wouldn't mind a bit of feedback, I'd recommend applying a little more follow through on your final shot on each string. I noticed your follow through between the first & second shots was good, but after the second (final) shot of most strings you were a bit hasty to lower the gun. This was most pronounced in the string at the 2:45-2:50 minute mark. Compare that string with the very deliberate follow through you had on the final shot of the stringing starting at the 3:30 minute mark. Again, not bad at all. Just remember that for every shot fired we should have two distinct sight pictures; the one before the shot, & the one after. (One shot string: sight picture>shot>sight picture) (Two shot string: sight picture>shot>sight picture>shot>sight picture) (etc, etc). Good thread. I've bookmarked it to keep tabs. 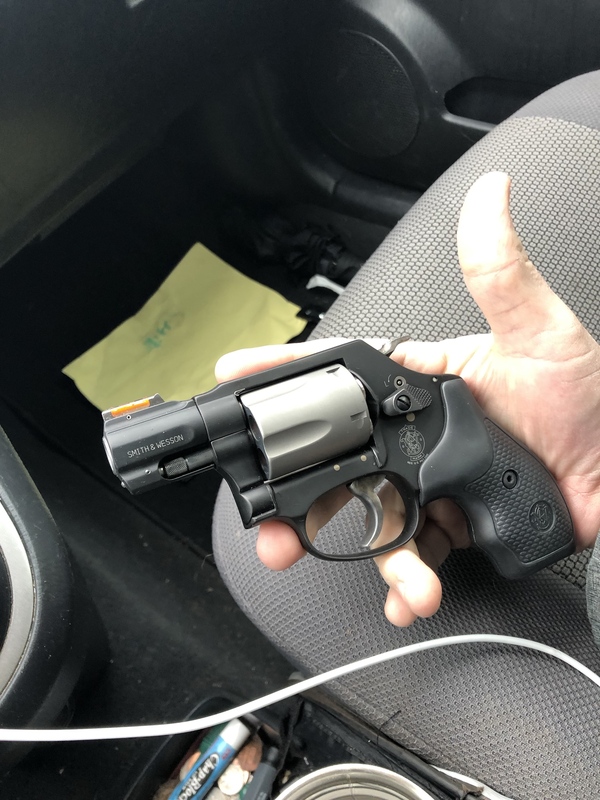 I've been on a big revolver kick lately and am looking to acquire my first. I want to find one to compete with also. The Model 10 is an interesting idea as a place to get started. Issued a S&W Model 10 in RVN with 12 rounds of ammo. "Here ya go son, if you go down in hostile territory you'll be good to go." (Everywhere was hostile I was to find out). " Oh, here's an M16 too!" (But it wouldn't fit in the back seat of a cobra - dang!). Actually liked the weight and feel of the model 10, but my fave S&W is the Model 64. I own a N-frame .44, which I like a lot, but is just too heavy for all day carry. Plus I’m afraid of setting my whiskers on fire if I ever have to use it for realz. With a 5” barrel, the fireball is pretty impressive. I also own a couple of J-frame .357s - a S&W 640, and a 340M&P. Of those two, the 340 is the only one I ever carry because it’s nice and light, and it slips into a pocket for trips to the mailbox, etc. I also have a FIST holster for it, but I rarely carry it that way because I don’t feel like I want that gun as my primary weapon. BUT... that all changes next week when I’ll become the proud owner of a Model 327 TRR8 - a 5” 8 shot N-frame that doesn’t weigh too much to carry. I just need to buy a left-handed holster for it. I will probably still carry one of my Glocks as my EDC going forward, but it will be cool to have a full-sized .357 for when I’m out in the country, or traveling to places where standard sized magazines are illegal. 74novaman, on the range, are you shooting .357 ammo in your .357 revolvers, or primarily .38 Special? I do, but man I've carried a little bit of everything over the years. Before this year and the wheel gun experiment I did occasionally still carry a 1911, but I'd upgraded to a Dan Wesson Guardian in 9mm. 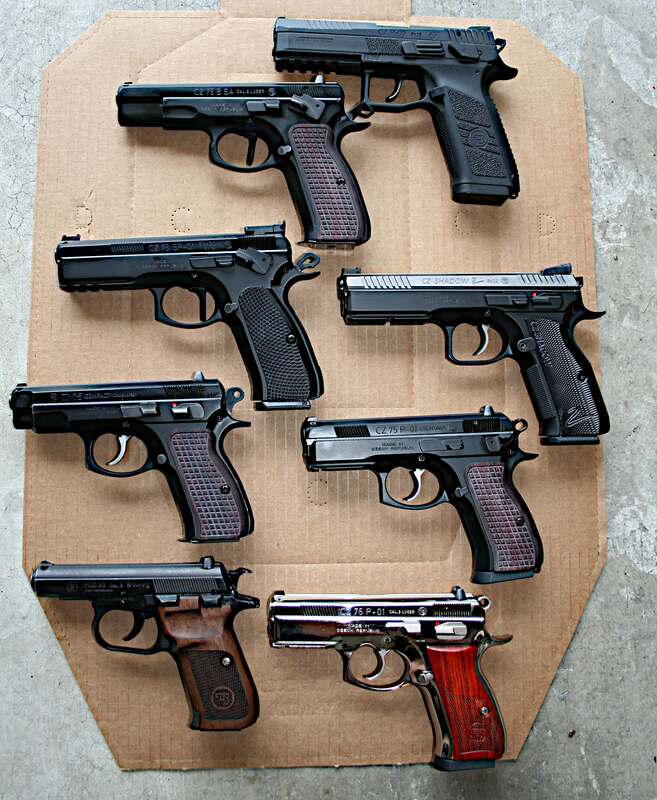 My biggest draw for the last few years has been CZs. Big, big fan. If you wouldn't mind a bit of feedback, I'd recommend applying a little more follow through on your final shot on each string. Yep, follow through is one of my biggest problems shooting (and one of the things I'm trying to work with by shooting wheel guns this year). Took a Pat Mac class in December and he made the same observations. That's part of why I'm trying to shoot these early drills cold without dry firing or shooting much before hand: to identify issues to fix. I'm hoping that by the time the end of the year videos roll around I'll be seeing noticeable improvement in several areas, including follow through. Out of the 5 guns I'm using this year, only 2 are .357s, so I'm keeping everything .38 for range time, competition, and carry to keep from having to worry about bringing the right ammo to the range, etc. The nice thing about the Model 10 is that Safariland makes the Comp 3 for it. If I can't use moon clips (my first preference), Comp3s are really, really good speed loaders. No twisting or messing around, just align the round with the cylinder and push in. There are better "gamer" wheel guns for IDPA, but I didn't want to add a 625, .45 acp, .45 moon clips, etc to the mix. But a 4" M10 is cheap, used ones already have a lot of the slop worked out of the trigger unlike my new smiths (which had to go to the gunsmith to be smoothed out) and with comp3s can be loaded as fast as any non moon gun can be. A used M10 is not a bad place to start with wheel guns, IMO. They shoot well, and they carry pretty well too. A 625 JM is the other I've really considered for gaming. Part of that is because I'm already setup to reload 45 ACP. I once had a 638 that I really loved. Someone did me a favor and they really loved it too so off it went. It went to a good home. Recently I acquired a grail gun of mine in the 360pd. I will now likely have the hammer bobbed with just enough to get ahold of if I should desire a single action shot. And I’ll be looking for some thin lightweight grips. Buffalo bore 357 hurts but with a death grip I can handle it quite well (I have catcher’s mitts for hands).